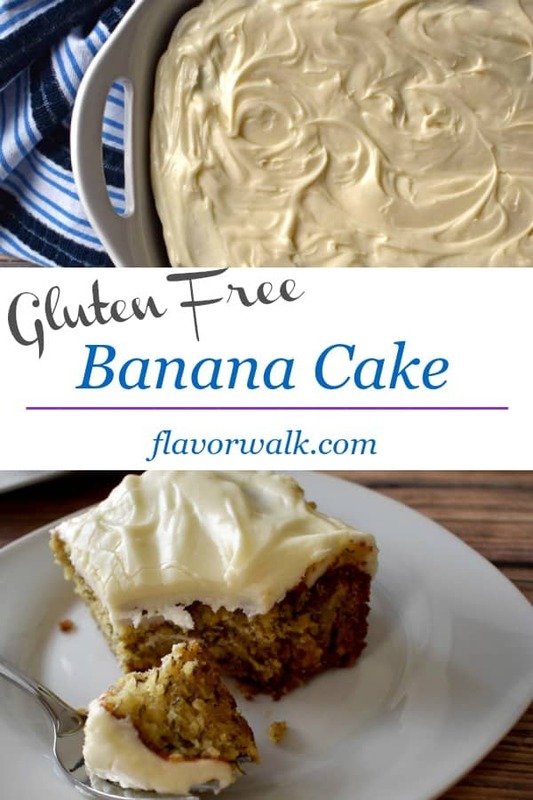 Gluten Free Banana Cake is super moist and tender. 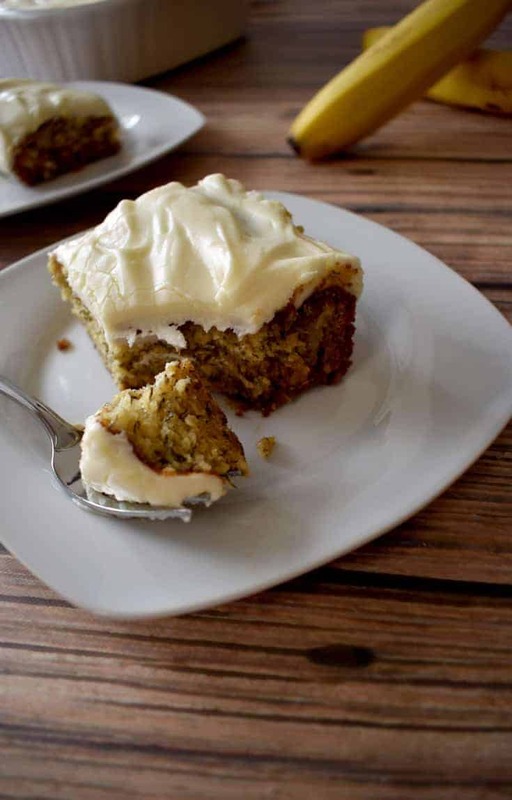 It’s delicious on its own, but the cream cheese frosting takes it to another level! 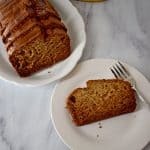 If you like banana bread, you have to try this tasty cake. Recently, Jim and I were at my parent’s house helping out with some yard work. They have good-sized front and back yards and there’s always grass to cut, weeds to pull, and bushes to prune. When we were done working for the day, we shared a meal that was capped off by a wonderful banana cake my mom had made. 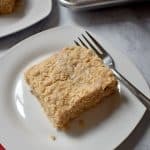 Instead of frosting the cake, she added finely chopped walnuts to the top to give it a little crunch. My mom mentioned she thought the cake would also be good with frosting in place of the nuts. 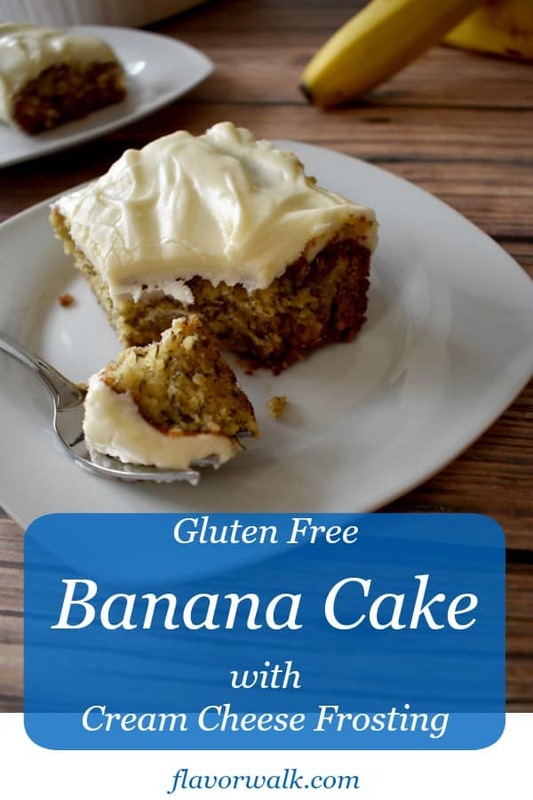 As a result, this gluten free banana cake with cream cheese frosting becomes the next recipe I share with you. The process for preparing the cake is quick and easy. You only need a large mixing bowl, wire whisk, wooden mixing spoon, and measuring cups and spoons. Add all the dry ingredients, except the sugar, to the mixing bowl and whisk together. 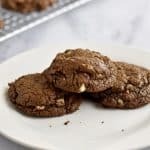 Whisking the dry ingredients before adding the wet ingredients ensures the leavening agents (xanthan gum, baking powder, baking soda) are thoroughly incorporated with the gluten free flour. Then add the wet ingredients and sugar to the mixing bowl and stir to combine. Finally, stir in the mashed bananas and pour the mixture into the prepared pan. 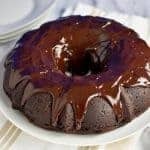 Bake in a 350-degree oven for 30 minutes or until a wooden pick inserted into the center of the cake comes out clean. Allow the cake to cool completely before frosting. First, grease the bottom and sides of the baking pan. You don’t want to leave behind any cake that’s stuck to the pan. When adding the mashed bananas, be sure to thoroughly mix them into the batter. 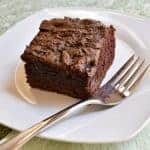 The bananas add flavor and moisture and you want the entire cake to be filled with flavor. Allow the cake to cool completely before adding the frosting. If you add the frosting too soon, the frosting will be runny. 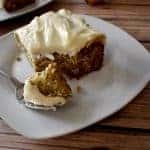 If you’re looking for an easy cake recipe with loads of flavor, give this Gluten Free Banana Cake with Cream Cheese Frosting a try. I know you’ll enjoy it as much as we do! Happy Baking! 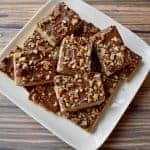 LOOKING FOR MORE RECIPES WITH BANANAS? 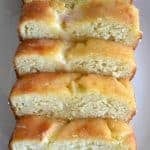 If you like this recipe, follow my Gluten Free Cakes and Cupcakes board on Pinterest. 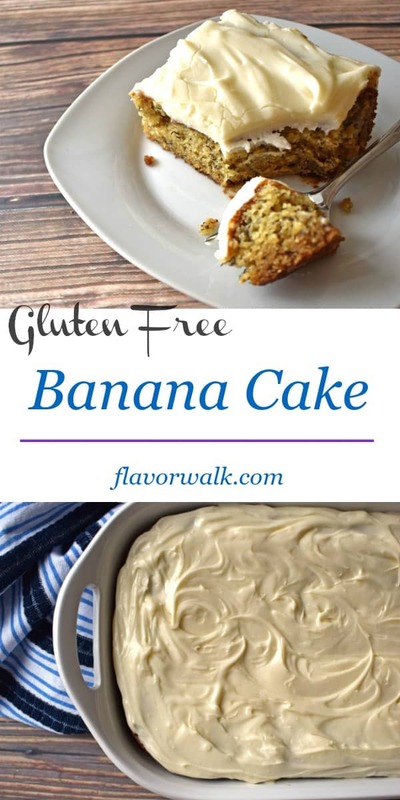 Gluten Free Banana Cake is super moist and tender. 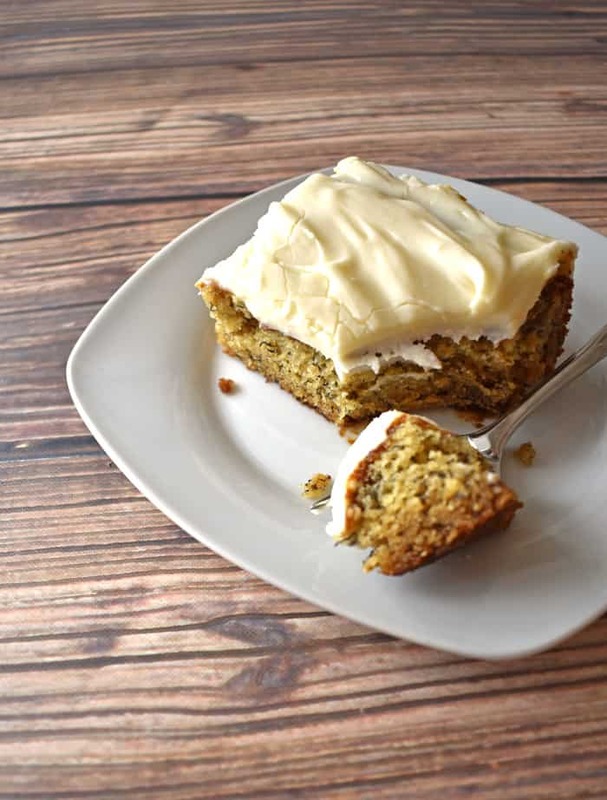 It's delicious on its own, but the cream cheese frosting takes it to another level! Preheat oven to 350 degrees and grease a 9" x 13" baking pan. In a large mixing bowl, whisk together the gluten free flour, xanthan gum, baking powder, salt, and baking soda. Add in the oil, sugar, eggs, lemon juice, and vanilla and stir until combined. Stir the mashed bananas into the batter making sure the bananas are incorporated throughout the mixture. Bake at 350 degrees for 30 minutes, or until a wooden pick inserted into the middle of the cake comes out clean. For the cream cheese frosting: Using an electric mixer on medium speed, beat the cream cheese and butter together until combined (about 3 minutes). Stir in the vanilla, then stir in the powdered sugar 1 cup at a time. You'll need at least 3 cups of powdered sugar, but you may need more depending on how thick you want the frosting. 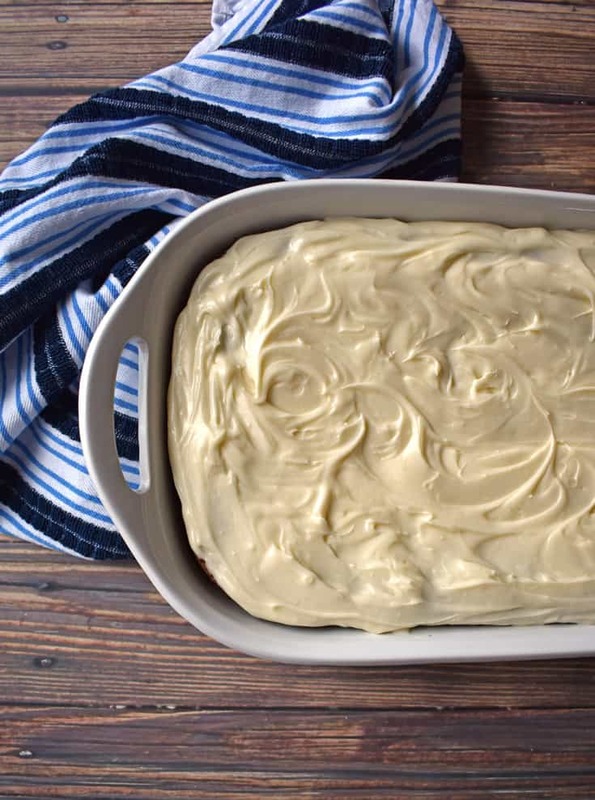 Once the cake is completely cool, add the cream cheese frosting and enjoy! 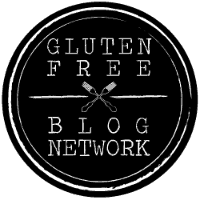 If you use a gluten free flour mix that contains xanthan gum, omit the xanthan gum from the recipe. 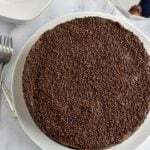 This cake is delicious! I have made this quite a few times! Thanks for taking the time to leave a comment. 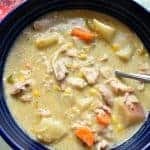 I’m happy to hear you enjoy the recipe.